The talking points below delve into some of the implications of banning new climate-damaging projects in Victoria. These talking points may be helpful when you are encouraging Victorian state MPs to support adoption of the No More Bad Investments (NMBI) model legislation. These talking points assume that the person you are talking with accepts that at least some action is necessary to tackle the climate emergency. Even now all-electric households with solar panels are on the rise, meaning the demand for gas is likely to fall. With NMBI legislation in place and carefull planning, taking into account likely closure dates of aging coal-fired power stations and potential depletion dates of current coal and gas sources, Victoria can have more renewable electricity generation and grid-level storage in place in plenty of time to ‘keep the lights on’. From Dept of Energy, Innovation and Science (2017) (energy-update-report-2017): Australia’s domestic consumption of coal and gas has risen only slightly over the last 40 years. We now extract almost three times as much ‘energy’ as we need. We certainly don’t need any new coal mines or gas wells to have sufficient fossil fuel supply to keep existing power generators running while we transition to renewable electricity generation. 80% of the coal we dig up is exported. A 27% increase in gas extraction in 2015-16 resulted mainly from new CSG wells drilled in Queensland to support the expansion of LNG exports from Gladstone. A floating LNG import facility in Victoria(http://www.theage.com.au/victoria/floating-offshore-gas-hub-proposed-to-tackle-victorias-energy-supply-crisis-20170605-gwkx67.html) is being proposed as a solution to a perceived domestic gas shortage caused by so much of our gas extraction being exported. Given that Victoria has adopted carbon reduction targets (Point 6 below), and given the need for urgent climate action, it makes no sense to invest in infrastructure that would assist and lock in continued gas use. It makes more sense to ban sales of new gas appliances and to stop installing gas distribution pipes in new housing areas now that very efficient electric alternatives are available and more and more households are installing solar PV. The Victorian parks network is a major carbon sink with at least 270 million tonnes of carbon stored in land-based parks. NMBI legislation targets all new climate-damaging projects, and would include bans on new approvals and extensions to current permits for logging native forests, such as in the East Gippsland Kuark forest and Victoria’s Central Highlands (the area of the proposed Great Forest National Park). In practice, climate impacts are already threatening lives and our well-being, so a more realistic target would be to reach net zero emissions absolutely as quickly as possible and to go beyond net zero emissions by drawing down the excess carbon already in the atmosphere. It makes no sense to continue to allow new climate-damaging projects that will make achieving climatetargets harder, particularly in cases where climate-safe alternatives are already available. However, the Victorian government is encouraging new off-shore and conventional on-shore gas development (https://www.premier.vic.gov.au/federal-gas-scheme-a-fracking-disaster/). Won’t that make it hard to meet Victorian carbon reduction targets? According to official carbon accounting rules, it probably won’t! Here’s why. As in Point 3 above, Australia currently extracts over twice as much ‘energy’ as we use within Australia, so it is highly likely that any new gas we allow to be extracted will simply increase the volume of gas we export. The carbon accounting rules adopted under the Paris Agreement only count the carbon emissions produced within a country’s own borders…despite the fact that the point of the exercise is to reduce carbon emissions everywhere. Obviously burning the gas we export puts us all at increased climate risk regardless of where it is burned. It’s a (perhaps accidental) dangerous sleight of hand that enables Victoria to ‘meet’ its climate targets despite condemning us to a grim future. Even if Victoria meets its net zero emissions target, the actual climate benefit of doing so could be completely(?) wiped out by the climate harm caused by allowing NEW fossil fuel exports. But, but…but!…if we don’t allow new fossil fuel exports, won’t some other country export more to meet demand, meaning our stance will bring no practical climate benefit? Maybe. But it would be a powerful demonstration that governments can ban new climate-damaging projects and refuse to make new fosil fuel export agreements on climate-ethical grounds. When one government shows that it is not only possible but relatively easy to do that, other states and nations are more likely to do the same. The Victorian government also supports Kawasaki’s Latrobe Valley coal-to-hydrogen proposal on the condition that it is no more carbon-intensive than the best gas-fired power generation (https://www.premier.vic.gov.au/future-uses-of-coal-in-victoria/). A hydrogen export market would be good, but it makes more sense climate-wise to use renewable electricity to produce hydrogen when there is excess wind power. According to this article, ExxonMobil (Esso) has bought the Dory gasfield in the Gippsland Basin which could contain up to 2 trillion cubic feet of gas, and has contracted a rig to drill the deep water off the coast of Victoria in the third quarter of 2018. Their current application (by Esso Deepwater Gippsland) being considered by NOPSEMA is for the adjacent Baldfish area. Cooper Energy is currently drilling in the Otway Basin and has plans to expand in both the Otway Basin and Gippsland Basin over the next couple of years. It would be interesting to see if a state government could block an off-shore oil or gas project solely on the basis of climate-related onshore impacts (for Victorians and the rest of the world). It seems neither the Victorian state coffers nor the federal government coffers stands to reap much in the way of financial benefit from the Dory gas extraction project. According to the 2017-2018 Vic government budget papers, Victoria expects to receive only $95 million in royalties from ALL sources (including minerals) in that year, so even if new onshore conventional gas extraction projects were approved the potential royalties are not likely to be huge. The federal Petroleum Resource Rent Tax (PRRT) has replaced state royalties for new offshore oil and gas, so Victoria would not receive any royalty income from the new Dory gas project. Since 2012 the PRRT applies to both onshore and offshore oil and gas, but it is set up as a tax on profits after all the exploration and extraction costs have been recouped, so it is usually many years before there is any benefit to Australia from the PRRT. “Unless prices spike higher, however, these five monster projects may never pay a cent in royalties or Petroleum Resource Rent Tax (PRRT). Unless the aggressive tax structuring of the oil majors is met with equally aggressive enforcement by government, the world’s biggest oil companies – Chevron, Exxon, BP and Shell – will pay very little in income tax too.” That is because current rules allow the companies to offset enormous amounts in PRRT ‘credits’ against their income tax liability. For example, Windlab’s nine-turbine Kiata Wind Farm was built using wind turbines manufactured by Keppel Prince in Portland. It is just one of the renewable energy success stories delivering jobs and investment to regional Victoria. Is it just that fossil fuel companies are more successful at lobbying the state government to approve new projects? All the government has to do is say yes to the proposed project and the jobs and benefits of the increased economic activity will happen. The state government may have to put some effort into strategies to encourage new clean-tech or other climate-safe projects. However, if there were a legislated ban on new climate-damaging projects, that in itself would give market certainty and encourage new renewable energy and other safe projects. Banning new fossil fuel extraction projects would indeed affect future export income since virtually all new extraction would be for export. 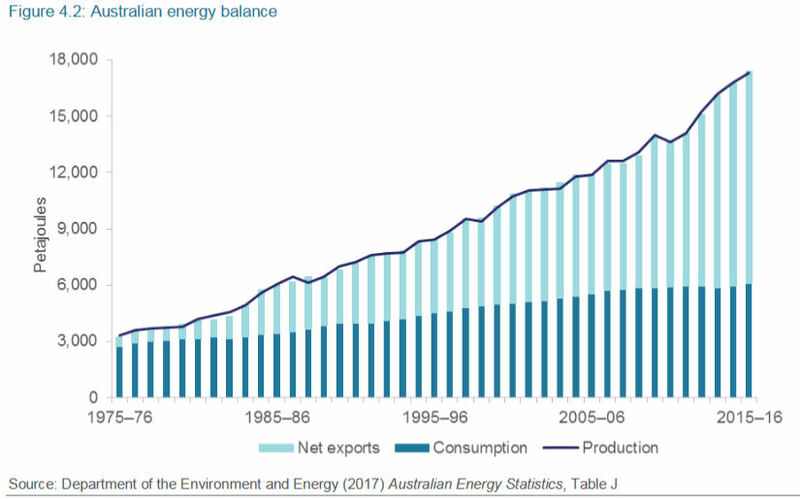 Australia’s domestic energy consumption has been close to flat for the last 40 years, and over half of what we extract is exported (Point 3 above). Various states have carbon reduction targets which, if met, will mean we need less and less extraction to meet domestic demand as time progresses. Assuming our current mines and wells are not depleted any time soon, we should need no new extraction projects to meet a falling domestic demand (and if they are depleted, new renewable energy projects can be built to meet demand rather than allowing new extraction projects). Other potential sources of foreign funds from foreign-owned companies are company tax, royalties, and Petroleum Resource Rent Tax (PRRT). However, for a new offshore project, Australia does not charge royalties, is likely to receive nothing in PRRT for a decade or more, and for some years will receive nothing in company tax either due to PRRT ‘credits’ (see Point 7 above). New coal and onshore gas extraction would attract state royalties, but based on historical figures (see Point 7 above) the amounts are likely to be less than one might expect, partidularly since new extraction projects tend to receive more in subsidies and other state government assistance than established projects. Currently the Victorian government deals with endless submissions and appeals related to threats to groundwater, endangered species, soils, native title, etc., whenever it receives an application for a new fossil fuel or logging project. Under NMBI legislation, there would be no new fossil fuel project or native forest logging applications.